The global automotive multi-wheel drive market reached a volume of 15.3 Million Units in 2018. An automotive multi-wheel drive, also known as an all-wheel drive or (AWD), is a type of automobile in which all the wheels receive equal torque from the engine. It includes vehicles that have four or more than four wheels such as SUVs, trucks, commercial lorries and luxury cars. Generally, in vehicles with two-wheel drive, the engine can supply power to either the front wheels or the rear wheels at a single point of time. Whereas, in all-wheel or multi-wheel drives, all the wheels of a vehicle operate simultaneously in order to provide better traction and handling during adverse weather conditions. They are also considered ideal for rough terrains like snow, ice, mud, off-road and sand, as these drives prevent slipping and help propelling the vehicle forward. Moreover, multi-wheel drives also enable the engines to distribute the weight in a more efficient manner. Increasing awareness among consumers regarding their safety while driving has catalyzed the demand for various advanced in-built safety features such as multi-wheel drive. In addition, to improve the traction and control over the vehicle, most luxury and sports cars are installed with multi-wheel drive systems. A shift in consumer preferences towards comfort and luxury driving with enhanced driving dynamics is further expected to augment the overall demand for luxury cars, SUVs and other sports vehicles across Europe and Asia. 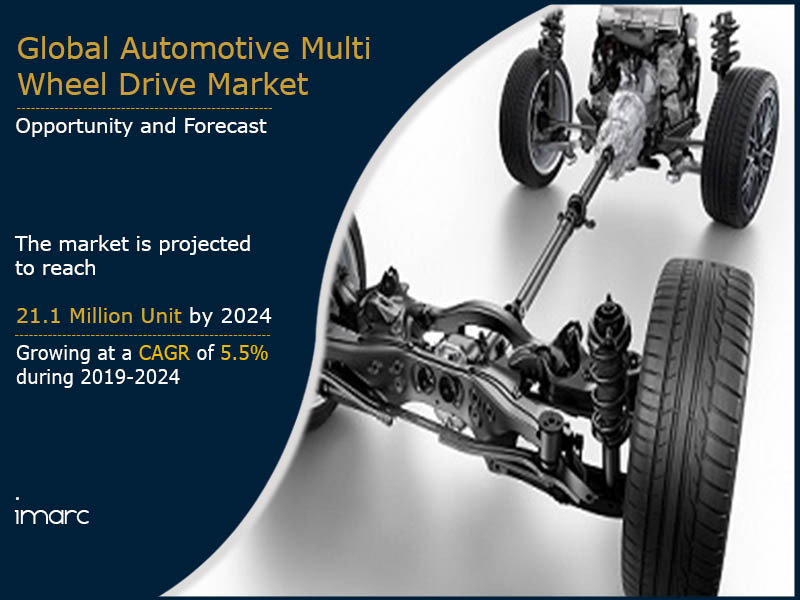 Looking forward, we expect the global automotive multi-wheel drive market to reach a volume of 21.1 Million Unit by 2024 exhibiting a CAGR of 5.5% during 2019-2024. Based on the vehicle type, the market has been segmented into passenger cars, light commercial vehicles and heavy commercial vehicles. Amongst these, passenger cars currently represent the biggest segment. Based on the transmission type, the market has been segregated as manual MWD and automatic MWD. Currently, manual MWD represents the leading segment. Based on wheel drive type, the market is categorized as all-wheel drive (AWD) and 4-wheel drive (4WD). Region-wise, the report has analyzed Asia Pacific, North America, Europe, Middle East and Africa, and Latin America. The competitive landscape of the market has also been examined with some of the key players being Borg Warner Inc, Continental AG, ZF Friedrichshafen AG, JTKT Corporation, Magna International Inc., American Axle Manufacturing, Eaton Corporation, GKN Plc, Dana Holding Corporation, Oerlikon Inc and Mitsubishi Motors. How has the global automotive multi-wheel drive market performed so far and how will it perform in the coming years? What are the key regional markets in the global automotive multi-wheel drive industry? What is the breakup of the global automotive multi-wheel drive market on the basis of vehicle type? What is the breakup of the global automotive multi-wheel drive market on the basis of transmission type? What is the breakup of the global automotive multi-wheel drive market on the basis of wheel drive type? What are the various stages in the value chain of the global automotive multi-wheel drive market? What are the key driving factors and challenges in the global automotive multi-wheel drive market? What is the structure of the global automotive multi-wheel drive market and who are the key players? What is the degree of competition in the global automotive multi-wheel drive market?